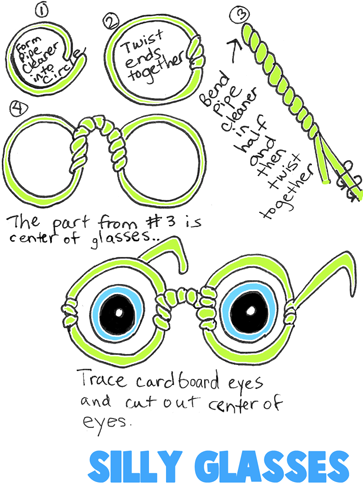 To make these 'crazy eyes' glasses, you will need pipe cleaners. Pick the color of your glases and then get several pieces of this color to make the entire pair of glasses. Firstly, form a circle with the first pipe cleaner, as seen in (picture #1). Then twist the ends together, as seen in (picture #2). Do this again for the second lense. Next, as seen in (picture #3) bend a 3rd pipe cleaner in half and then twist together. This will be the center of the glasses....just twist the center of your glasses around the 2 lenses as seen in (picture #4). Just twist the arms on to both sides of the glasses. Next cut out 2 cardboard eyes and draw 2 more circles...one color it a color such as blue, green, brown, or make it crazy red with spirals. The center should be black and then cut a tiny circle out so that you can see. And then just glue to the back of the glasses. There you are...silly 'Crazy Eyes' Glasses. 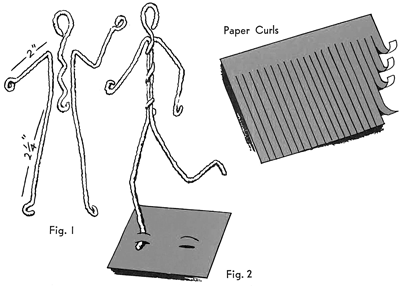 To make these figures, you will need 2 pipe cleaners, face cut-outs, and glue. 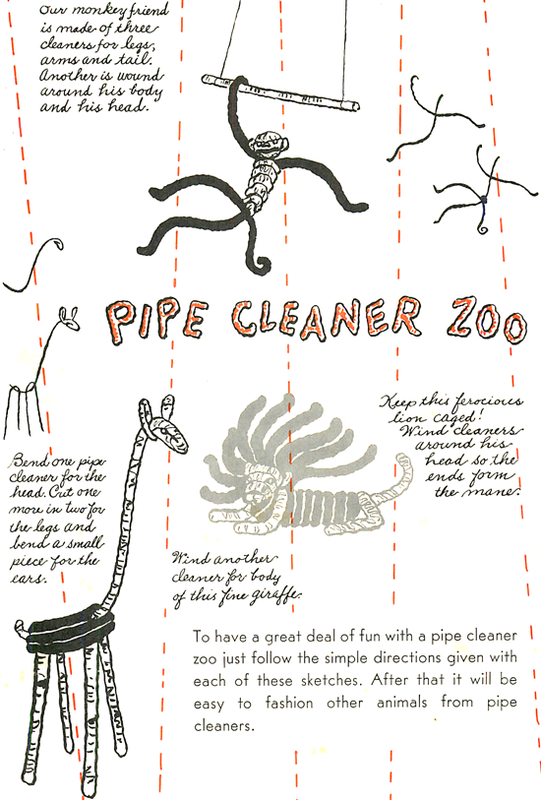 Follow the illustrations above carefully to make the pipe-cleaner figures. Go from illustration a to e. Glue faces to heads of figures. It is a lot of fun to cut out a piece of each your family members to make figures for your entire family. 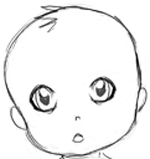 To turn the about pipe cleaner figures into a baby, just turn the legs and arms as you see in the illustration above and then tape a baby picture to the head. Use a match box for the body of the wheelbarrow. Cut one end from the tray of a match box in the manner shown in figure 1. Then cut one pipe cleaner in 2 equal parts, and a second pipe cleaner into 3 sections, 2 each 1 1/2 inches long, and the third section 3 1/2 inches long. Use the pipe cleaner halves for the handle of the wheelbarrow. Bend as shown in Figure 2. Use the 1 1/2 inch pieces for legs and the 3 1/2 inch piece to attach the wheel to the wheelbarrow. 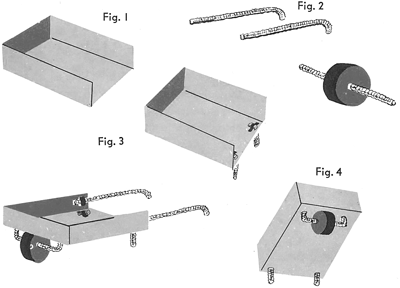 Insert legs in holes punched at the open end of the wheelbarrow and fasten with Scotch tape, as seen in figure 3. (Parental Help Needed on this Part of the Project to Cut the Cork) Use a cork, cut to measure 7/8 inch in diameter and about 1/4 inch in thickness, for the wheel. Make a hole in its center. Run the 3 1/2 inch piece of pipe cleaner through it. Attach the pipe cleaner ends to the underside of the wheelbarrow with Scotch tape. Do again with the wheelbarrow handles, as pictured figure 4. Bend 3 pipe cleaners as shown in Fig. I . Twist lower ends of headpiece around the middle sections of arms and legs to form the body. Fig. 2. Cover the head loop with cotton and a piece of white cloth. Gather in the back and sew firmly. Pair* in facial features. Use yarn or curled strips of paper for hair. Sew or glue in place. To make the figure stand use a cardboard base 2 Fig. I inches square. Cut 2 slits I/8 inch apart in it. Slip one foot through these slits. Fig. 2. If doll is top heavy cut a second slit in base and anchor the other foot of the doll. Bend arms at elbows and legs at knees for action poses. Use crepe paper or cloth to dress dolls. Put together with glue or needle and thread or simply hold parts in place with fingers and tie with thread. (Click on Image to View Bigger Picture) Pipe Cleaners are a lot of fun, and here is the proof above. You can make your very own pipe cleaner zoo-ful of animals with a handful of chenille stems. You name it, you can make that animal with these funny little craft items. Have fun. All kinds of figures for favors may be made of pipe cleaners. Decorate them with fabric clothing made of cloth scraps, and paint in features. Mount them on small wood blocks or, where possible, shape the feet so that they will stand independently. 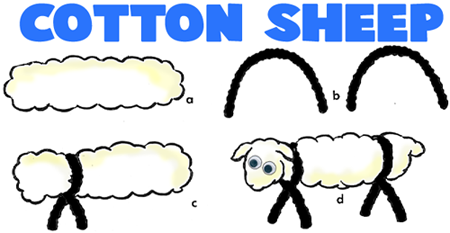 Take a bit of cotton (any type of cotton can be used...cotton in a big, dental cotton rolls, cotton sheets)....either way... roll it into a cylinder. Tighten and twist legs in the front and back of the sheep figure. Pinch out ears for the sheep. Paste on googley eyes....this should stand up for you. Find some fabric, felt, tissue paper, or other type of paper. Now cut them in long strips. Now fold front and back, front and back, like an accordion. When the paper has been folded...then take a pipe cleaner and bend it around the center of the flower and then pull it open. You can bend a pipe cleaner around the stem pipe cleaner in loops to look like stems. Making Valentine’s Day Hearts Candy Doggy Card with Pipe Cleaners - If you want to make a special Valentine’s Day Card Treat to give out to your friends and classmates this year at school, then here is a tasty and inexpensive project to make. It is a Tootsie Roll, Standing Hearts Doggy Card. The easy to follow, illustrated steps can be found below. 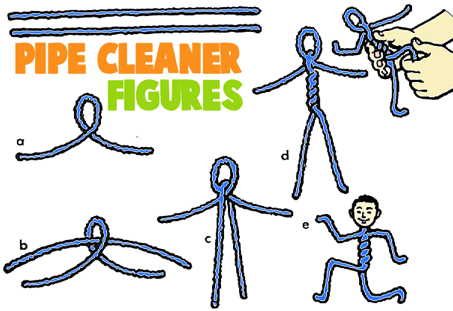 Toy Figurine Pipe Cleaner Pencil Toppers - This is a great way to bring your toy figurine to school with you. Just make it into a pencil topper with a simple piece of pipe cleaner. 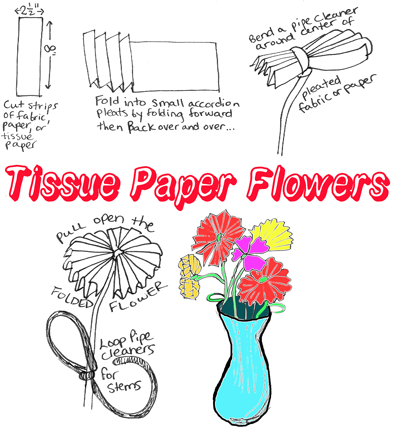 Tissue Paper Carnations - Make these beautiful flowers with tissue paper and pipe cleaners. Egg Carton Tulips with Pipe Cleaners - These turn out beautiful and are easy to make. Find out how. Doily Baskets - Make a beautiful basket out of a doily, ribbon, and pipe cleaner. Flowers from Drinking Straws Pom Poms and Pipe Cleaners - Find out how ot make these adorable flowers with these simple instructions. Crepe Paper Flowers - Don't these look real? Find out how to make these with crepe paper and pipe cleaners. Make Handbags with Felt, Pipe Cleaners,a nd Ribbon - If your little girl wants to be just like Mommy and the big girls with her own purse, this is a creative way to give in without actually spending money on expensive accessories for a pint-sized clothes horse. It could easily be made as a pouch or satchel for a boy as well. How to Make a Halloween Spider with Pom Poms on His Web - This spider web is made from yarn and chopsticks...the spider is made with googly eyes, pom poms, and pipe cleaners. Pinecone Turkeys with Pipecleaner Feathers - Learn how to maket his adorable thanksgiving turkey with a pine cone and pipe cleaners. Egg Carton Catepillars - Learn how to make cute little catepillars with an egg cartons and pipe cleaners. Making Jack-O-Lantern Pumpkin Beads - This is a very easy craft to make. It only takes a few minutes to make. All you need is a bead, a pipe cleaner, and some paint. Hanukkah Hanging Star of David Ornaments to Make with Pipe Cleaners- Celebrate Hanukkah by hanging these sweet decorative Star of David ornaments in your home. You don’t have to have a Christmas tree to have fun, you and your children can decorate your home for Hanukkah and have just as much fun. These Hanukkah ornaments are easy and fun to make and look very beautiful as well. Cotton Pipecleaner Snowman - Make a snowman from cotton, construction paper, and pipe cleaners. Clothespin Pipe Cleaner Grasshopper - This is a great craft for preschoolers and young kids. Use a clothespin and some pipe cleaners together and they make for a great grasshopper. Making Egg Carton Pipe Cleaner Flowers - You can use egg cartons, muffin tins, and pipe cleaners to make these flowers. Easter Egg Trees - Find out how to make Easter egg trees with branches, pipe cleaners, and decorated eggs. Baskets with Berry Containers & Pipe Cleaner Handles - Use a berry container as the base of a decorative basket...using ribbons weaved in and out of the slots to pretty it up. Pipe Cleaner Styrofoam Horse - This horse is made with yarn, styrofoam and bent pipe cleaners. Chenille Stem Bump Llamas - Make these llamas with Chenille Stem Bumps and some ribbon or yarn. Styrofoam Pipe Cleaner Lions - Who doesn't want a lion in their toy figurine collection? Learn how to maket his one with pipe cleaners and styrofoam. Bookworm Pipe Cleaner Bookmarks - The pipe cleaner antennae are what makes this bookworm paperclip bookmark so special. Bump Chenille Stem Monkeys - These monkeys are made with a different kind of pipe cleaner called Bumps. Find out how to make theme here. Styrofoam & Pipe Cleaner Elephants - If you love elephants, then look no further than this Styrofoam ball craft...the feet and trunk are made with pipe cleaners. Cats Made with Bumps - Make cute adorable cats out of Bumps Chenille Stems and some tooth brush bristles. Chenille Stem Bump Camels - Use a special type of pipe cleaners that have bumps in them to make these cool camels. Styrofoam & Pipe Cleaner Giraffes - Pipe cleaners are great for giraffe necks because they are so bendable...make these giraffes with a piece of styrofoam and some bendy pipe cleaners. Styrofoam Pipe Cleaner Monkeys - Monkeys are so adorable...you can make this little guy with pipe cleaners and styrofoam. Fingerprint Ants in Pipecleaner Grass - Pipe cleaner grass and a sand anthill is what this picture is all about. Make the ants with a black fingerprint. Chenille Stem Bumps Giraffes - Use a special type of pipe cleaner called Bumps to make these giraffes with their tall necks. Jar Lid Bugs - Make these adorable little bugs with jar lids and pipe cleaners. Cows with Bump Chenille Stems - Make these standing cows with Bump Pipe Cleaners.